No matter the strength of your company’s defense strategy, it is inevitable that security incidents will happen. Poor and/or delayed incident response has caused enormous damages and reputational harm to Yahoo, Uber, and most recently Facebook, to name a few. For this reason, Incident Response (IR) has become a crucial component of any IT Security department and knowing how to respond to such events is growing to be a more and more important skill. Aspiring to switch to a career in Incident Response? 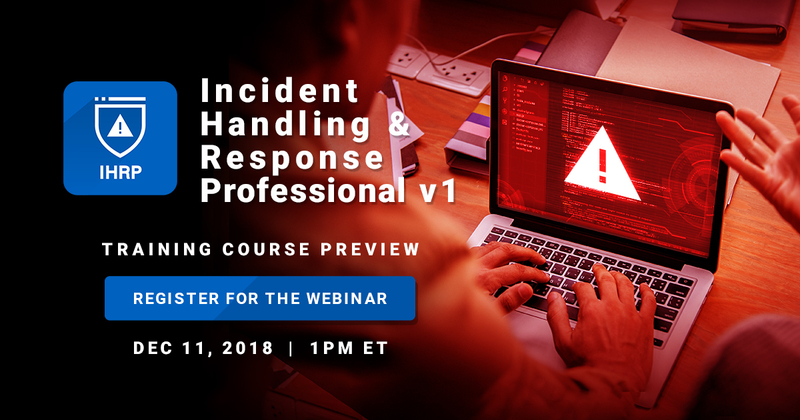 Here’s how our new Incident Handling & Response Professional (IHRP) training course can help you learn the necessary skills and techniques for a successful career in this field. This training is the cornerstone of our blue teaming course catalog or, as we called it internally, “The PTP of Blue Team”. Be the first to know all about this modern blue teaming training course, join us on December 11.